OUR CD IS OUT !!!! Reach us at 716-557-8978; confluencesound@gmail.com. Have a listen below. 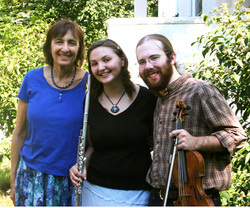 CONFLUENCE Trio, from Olean, Rochester, and Ithaca NY, is a highly creative, versatile, and energetic band consisting of Nadine Dyskant-Miller on flute and foot-percussion, Tim Ball on fiddle, and Barbara Dyskant on keyboard. We feature both contemporary and traditional arrangements of music from Quebec, Ireland, New England, and elsewhere, plus modern grooves and rhythms and plenty of original material. Contra Dances are a specialty. Our music ranges from intensely driving to silky and lyrical, and is always high energy, filled with verve and life. We happily mix styles and rhythms to create exciting twists and surprises. Within this you will hear (and feel) hints of blues, jazz, and Latin material tucked within the texture of our grooves. Or, if you prefer, we can offer a traditional program played as musicians did years ago. Another option is a serene concert of waltzes, airs, and classical selections. Our musicians function as more than their number. Nadine plays simultaneous flute and foot-percussion with pulse and ease. Barbara plays both back-up and melody on keyboard with rapid precision and gusto, and Tim provides lightning fiddle with intensity and sensitivity. OF SPECIAL NOTE is the soaring and seamless interweaving of flute and fiddle, ramping up the intensity and pulse of driving tunes and providing gorgeous lyricism in melodic selections.